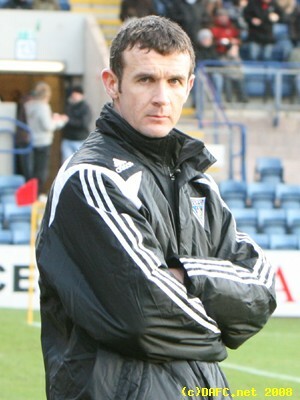 The Pars Supporters Trust in association with DAFC present the first opportunity for the fans to "Meet the Manager", Jim McIntyre, on Thursday 24 January 2008 at East End Park. Having started his managerial career with an unbeaten run of 6 league games and winning his first manager of the month award,this is a chance for supporters to ask Jim McIntyre and his new back room staff, how did he do it? Jim will be at the Kingdom Suite at East End Park next week to speak with the supporters. It is expected that he will be joined by his new coaches, Gerry McCabe and Stephen Wright, along with some of the players. In the usual format, the supporters will have a chance to ask questions from the floor, perhaps; "What is the new manager`s aspirations for the remainder of this season?" "Will there be any last minute signings as the transfer window comes to a close?" and " How will the new coaching staff approach the development of local young players?" Jim McIntyre. Dundee v Pars 5th January 2008. The event as usual is free admission, starting at 7pm in the Kingdom Suite, East End Park. The bar will be open (sadly, that will not be free!). The event will finish at or around 8.30-9pm. DAFC and the Pars Supporters Trust look forward to seeing you all there on the 24th.